Using my original SketchUp drawing, I saved a 2D PNG version looking directly at the side panel. I scaled this up in GIMP to the actual dimensions at 72dpi, saved as PDF, and printed it at full scale on the plotter at work. I then cut out the pattern and taped it to a piece of 1/4" 2x4ft MDF. Paper pattern taped to 1/4" MDF. Using a jigsaw, I cut around the template, making sure not to cut over any of the lines. I occasionally had to stop and re-tape the pattern as I cut across the tape originally holding it in place. 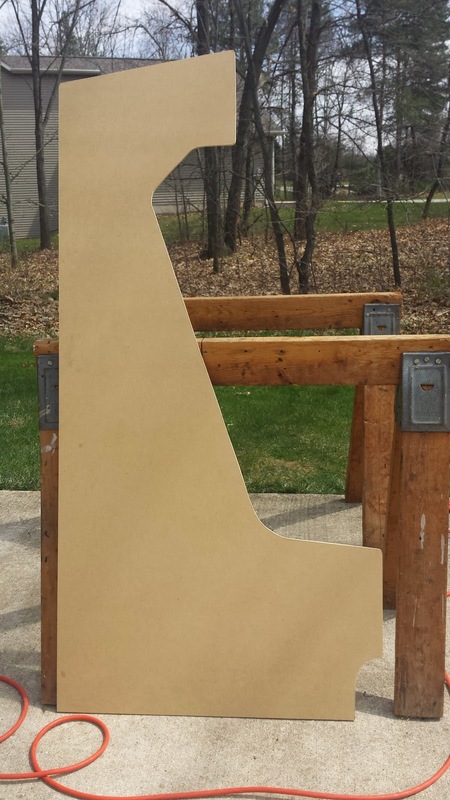 1/4" MDF cut to shape with jigsaw. Once the template was roughly cut out with the jigsaw, I got out a straight file and filed the edges straight & flush with the lines on my paper pattern. After lots of filing, I removed the paper, and used a pen to trace around a metal washer at all of the sharp corners in the pattern. Then I filed the corners round using the lines as a guide. 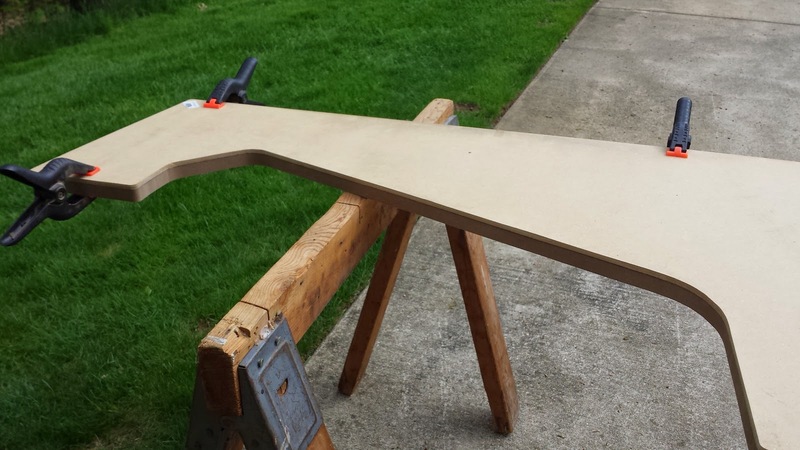 Completed wooden template for top section of side panel. 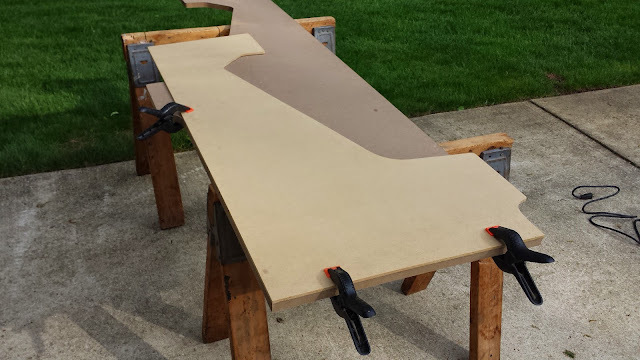 I clamped my template to the top half of a 2 x 6ft sheet of 3/4" MDF. 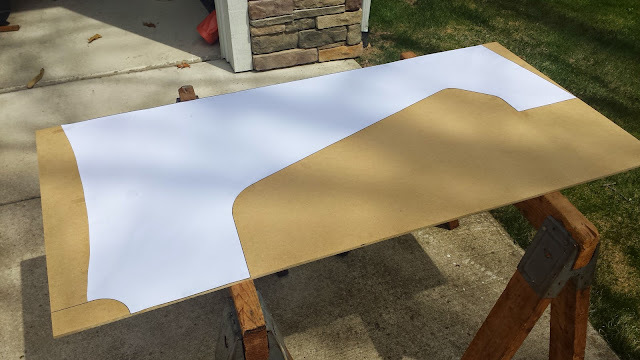 (This sheet is the product of Lowes cutting a 4 x 8ft MDF sheet into one 2 x 4ft sheet and two 2 x 6ft sheets for me so I could fit them into my car). I traced around the wooden template and removed it. I then used a straightedge to continue the incomplete straight line down from the bottom-front. I cut around the outline with my jigsaw, leaving about 1/2" of space between my cuts and the lines I'd drawn. I left that extra bit of space between my jigsaw cuts and the final edge, because I couldn't make a true perpendicular cut with a jigsaw if my life depended on it. That's where a router comes in. 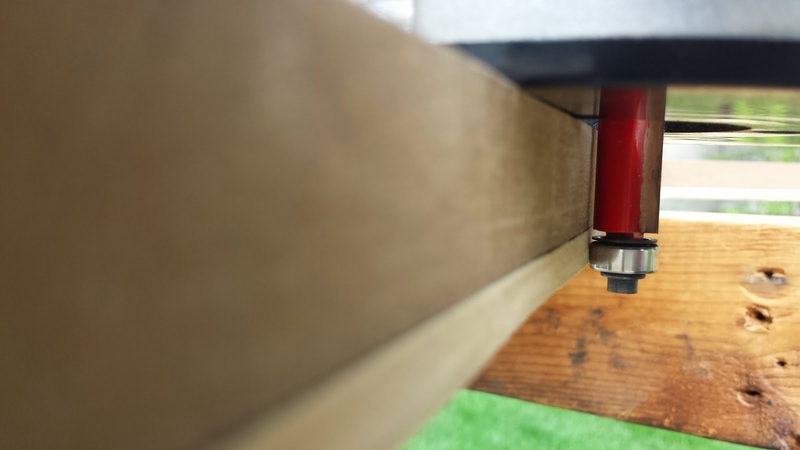 Once I had my rough cutout, I reattached and securely clamped the top-section template. 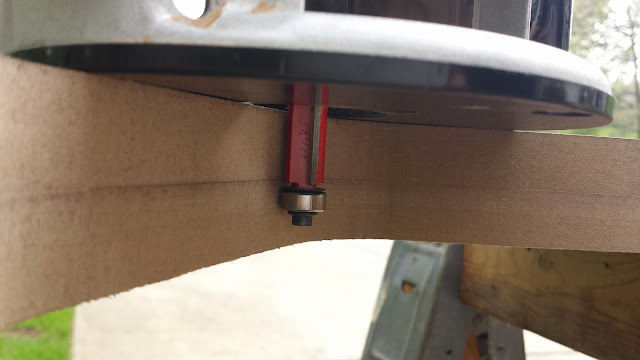 I used a duplicating router bit to cut the side panel to match the template (see the photo at the top of this post for how it works). Top two-thirds of cabinet has been cut using duplicating / template bit on router. 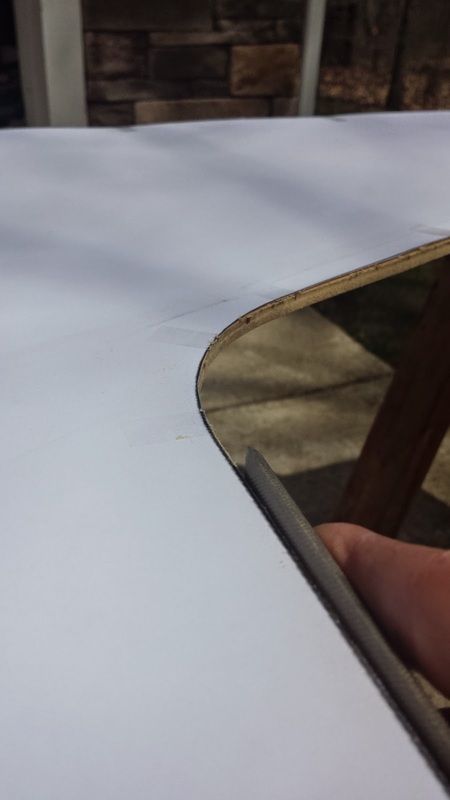 When I got to the bottom 2 feet where the wooden template stopped, I just flipped the template over, re-clamped it, and used the straight edge on the back as a guide. 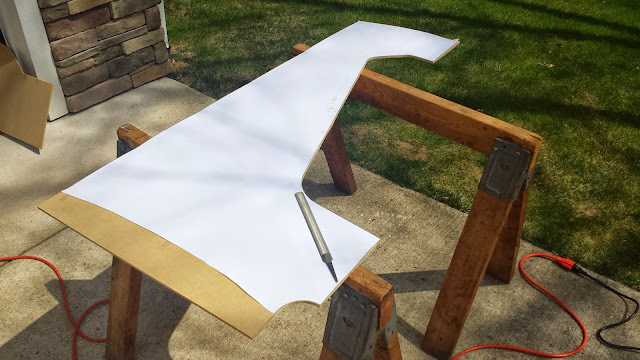 Using the back of template to complete cutting the bottom-front section of the side panel. With one side completed, I repeated this on the second side. This time, I used the first side as the template piece. Using the first completed side panel to create a duplicate panel. Once I got the sides cut out, just for fun, I clamped them to the frame so I could get an idea for the eventual scale and look of what I've been working on. 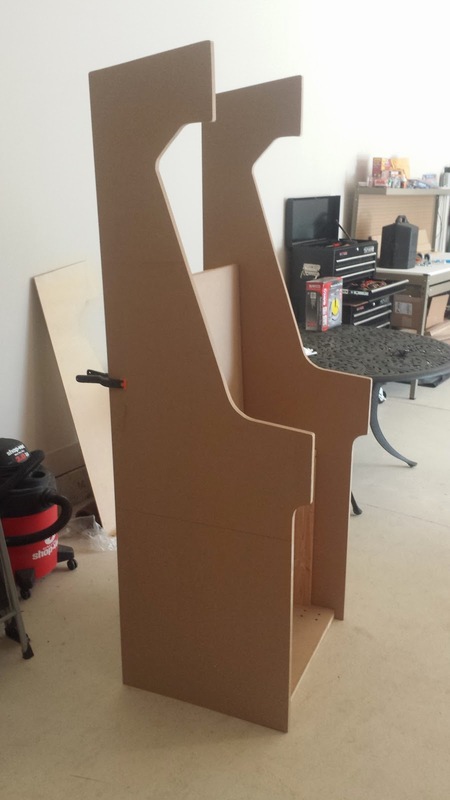 Side panels clamped to the frame. Any updates? Have been enjoying reading about this build. Also, I love the circular saw guide you made! Thanks! I'll have some more updates in the next week or two. I think I'll be doing a lot of assembly this coming up weekend. I basically have all of the separate components cut out and tooled. Now it's time to put them all together. In the meantime, I also have some more recent progress here.